The takeaway is that despite its steep costs, we can’t afford to not support an idea like fusion. While the realisation of nuclear fusion power is often raked up as a fitting example of a sunk cost fallacy, the amount of work going into realising it someday is as necessary as it is intensive. When the first explosion by a nuclear fusion reaction was conducted in 1952, scientists were filled with optimism about harnessing the power of nuclear fusion in a controlled manner – for production rather than destruction, and for generating clean energy. But for years, the technological and scientific hurdles of this proved to be too much, leading many a pessimist to wonder: can we actually harness this stellar formula for producing energy on Earth? Most of the world’s leading fusion energy projects employ a tokamak, a doughnut-shaped chamber that is made to hold the plasma in the grip of a strong magnetic field, in turn generated by strong electric currents. The plasma is a superheated state of matter that acts as a fuel-bed for the fusion reaction. The stellarator, while borrowing a similar doughnut shape, uses a system of coiled magnetic fields to contain the plasma, relying less on the strength of the current itself as well as proving itself less fragile than the tokamak. As a result, the stellarator can operate continuously rather than in short pulses. In another major boost for the fusion community, just five days after the 7-X powered up, physicists in China announced that their homegrown tokamak fusion machine, Experimental Advanced Superconducting Tokamak (EAST), had successfully produced and contained plasma at a temperature of close to 50 million kelvin for an impressive 102 seconds, three orders of magnitude better than the 7-X’s quarter of a second (impressive in its own right). Does this mean the tokamak is better than the stellarator? Both EAST and the 7-X were able to achieve the latter attributes – but both were shots in the arm for the tokamak and research communities, respectively. The tokamak provides scientists with critical data on plasma physics while simultaneously functioning as working proof of the ability of a stellarator and a tokamak to function as the core of a fusion energy power plant in the future. According to the World Energy Council, we are already dangerously close to a point where the demand and consumption of energy by the existing population outweighs the available energy. Current technology is incapable of supplying the shortfall, at least not single-handedly. Nuclear fusion may just be that magic technology that solves this impending crisis. It has all the tropes that accompany an ideal energy source: it is reliable, has a seemingly never ending fuel-supply and, most importantly, is clean. Given our ongoing struggle with mitigating the effects of climate change, it’s imperative to back such an energy source. As Michael Williams, head of engineering at Princeton’s Plasma Physics Lab, told Huffington Post, “Fusion is an expensive science because you’re trying to build a sun in a bottle.” Engineers have to come up with materials that can sustain large structural and thermodynamic loads along with radiation that can cause damage at the atomic level. Physicists have to figure out how to achieve maximum containment and control turbulence in plasma. And, ultimately, the undertaking has to continue to be funded. Consider the the International Thermonuclear Experimental Reactor (ITER) project. It is a labour-intensive umbrella undertaking involving the European Union, India, Japan, Korea, Russia, China and the USA – with the final aim of using a fusion reactor to consume 50 MW and produce 500 MW. The project was initially seeded in 2006 with an estimated cost of EUR 5 billion and first plasma test in 2016. The cost today stands at EUR 15 billion and the first plasma test slated for around 2023. While construction for the test device has begun in southern France, the project schedule was advanced after a project’s governing council met last year. And while the official communiqué didn’t release an official date for the first plasma test, it is widely rumoured to be closer to 2025. Why is ITER taking so much time to get off the ground? Elizabeth Surrey, head of fusion technology at the Culham Centre for Fusion Energy, Oxfordshire, states that a commercially viable fusion power plant is such a complex integration of so many interconnected systems that “no single entity can be identified as the major obstacle”. In a recent interview, Thomas Klinger, project head of the 7-X, highlighted how some structures his team built weighed tonnes – but had been assembled with a level of precision of a few microns. “If we had known how difficult it would be to build, we might not have embarked on it in the first place,” he remarked. ITER suffers because of the scale at which its collaboration operates. According to Michael Classens, the head of communications, “The main challenge for the project is not the science and technology itself, but the management as a whole, the way these 35 countries cooperate.” Even Osamu Motojima, former director-general of the ITER Organisation, admitted that “it’s a bottom-up process that integrates technical data and work schedules for different components made by different countries”. Another problem for the project is that some member states working on schedule end up funding an expensive delayed production schedule for a slacking member state. But even as ITER soldiers labours, one can’t help but be optimistic. According to Steve Cowley, chief executive of the United Kingdom Atomic Energy Authority, “It can’t possibly be that we’ve got this close and we can’t see it through to the end. Once this problem is cracked, we’ll have [fusion energy] forever. 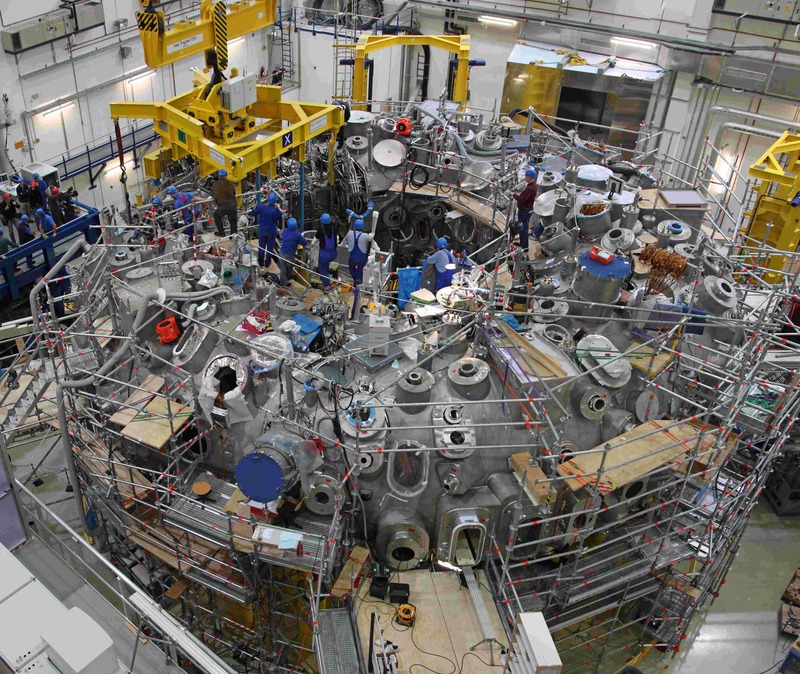 It’s just taking a long time to get there.” Meanwhile, as a backup to the ITER design, there are groups across the world working on alternatives that could provide significant breakthroughs and data for the fusion energy community. China has EAST, Germany has the 7-X, and the US was able to recently achieve a breakthrough in inertial containment fusion.